I've been waiting to see the figures of how much we've been spending since December 5th when we first stepped foot on Ecuador soil. It seems like so long ago, yet it's been exactly 10 weeks today! Truly, I feel we've been living here so much longer, perhaps because we have moved so much (four times in 8 weeks) and have met and shared meaningful times with so many different people, some we now call friends. We looked at two different apartments for rent in the last 3 days. Why? Hey, why not? We're always looking for a better deal and also for the place we can call home, and maybe we're in it already and just don't know it. Honestly, after the last two apartments we just looked at, this place is a palace! Our $500 a month all-inclusive 2 bedroom, 2 bath, room with a view "departamento" right in the heart of El Centro is beginning to look pretty fancy and quite reasonably priced. The last two apartments both had "suicide showers." Suicide showers are a home-installed water heating system where the hot water for the shower is heated directly inside the actual shower head. Stray wires, a lot of insulation tape and a combination of water and high voltages of electricity creates the warm (if you're lucky hot) water. If the installation is faulty, sparks and shocking will occur. Fun, huh?? The first "available now" rental we looked at Sunday morning was only about 6 blocks up from Simon Bolivar where we now live, so it was a perfect location and only $400 a month completely furnished. However, it was Oh So Small and had too many pink, yellow, limey green, and blue walls for me. The couple renting it proudly showed us around and were absolutely unaware they had a suicide shower! It looked deadly!! They thought that's how the bathrooms here were. They're going back to Washington anyway, so I didn't put the "you could die" fear in them. Hopefully, they won't touch it before they exit or they're in for a real shock!! The second apartment we looked at today was very rough or rustic funky - but, gee, it was only $195 a month for a 3 bedroom, 2 bath unfurnished place and right across the street from the mercado, a great location! Well, you definitely will get what you pay for here unless you happen to find the deal of the year. So, again, we are feeling quite blessed and happy right where we are at. I got to thinking about our continued quest for the next best rental. Before we came here, we had researched many blogs and articles on-line, since we wanted to have a realistic idea of the housing and cost of living (as well as the weather, medical care, foods, and people). Housing and cost of living varied depending on what article or blog we read. So, we decided, from day one, to keep a daily running total of every penny (yes, penny!) we spent so that in two or three months we would have a realistic idea of what our own personal budget would be. Of course, with the four apartment rentals in two months and the added expenses for being on a vacation the first month here and eating out a lot, then the relocation services, etc., we knew we would be spending less once those expenses died out of our list. Now that we're more settled in and know where to shop and are riding the bus more than taking taxis, we are able to get a more realistic monthly expense list that we will try out for the next two months to see if it works for us. I wanted to share our personal budget because I believe that there are many opinions from varying lifestyles living in Cuenca - some more extravagant than others, and some more frugal. There are many expatriates here who have enough money to go out every night to eat and not blink an eye, and there are those who are on a fixed pension income which will be the ceiling for what they can spend, hopefully with some left over to save. When Bo and I left Oregon and the USA, we repacked our bags! By that, I mean we both wanted to truly simplify our lifestyle and live modestly and frugally, focusing on the things that are truly important to us - the people we meet and the way we spend our time. We are still both on the same page (that's a good thing when you're married), and the longer we are away from our USA rut, the more we are enjoying our new focus and way of life. Like today - we shopped frugally and wisely. We bought only what we needed, and we do not have extras of anything at home. When we run out of something, we go to the store. We have one of everything. I have 3 cleaning products and a bottle of vinegar. We buy fresh food daily, and there is little or no waste. We're getting even better about this. We cook 90% of our meals and eat out only at the delicious Ecuadorian restaurants, where we can buy a full course meal for two for $5 to $6 (Really!!!). We continue to learn more ways to be frugal and save the longer we live here. PHONES - $10 (We each buy $5 worth of minutes each a month, so far with leftover minutes). For us, this is a very realistic budget right now. We are not interested in dining at fancy expensive restaurants, paying high rents, or living out of walking distance to El Centro. We like being close to all our needs, and we are excited at the possibility of having this budget work for us long-term. Of course, this could change, but for now it's feasible and what we personally hope to live on. I'm glad we had the determination and self-discipline to keep a record of our daily spending from the day we arrived. It took a bit of time and thought, but we knew it would pay off and be helpful in the end. I'm a visual person. I have to see it before I believe it. As much as we go shopping, I was under the false illusion that we were spending a lot of money on produce and groceries. Afterall, we also buy a lot of seafood each week. In the states, that was a big big chunk of our grocery bill. So, now I know and I'm thrilled! I'm also thankful I have a husband who is money-frugal and conscientious. He is not a tight-wad and would lay the world at my feet if he could (and he has!!). Like I said, we're both on the same page at this season of our lives, and that's a good thing!! Again, this is our story and our personal journey and choice. I hope this visual helps those planning to move here and those already here. HAPPY BUDGETING! We live one-half block from Cuenca's fabulous Parque Calderon. We love walking over here at night when the city is lit up and sitting on a bench and people-watching. It's an active and wonderful area of El-Centro. 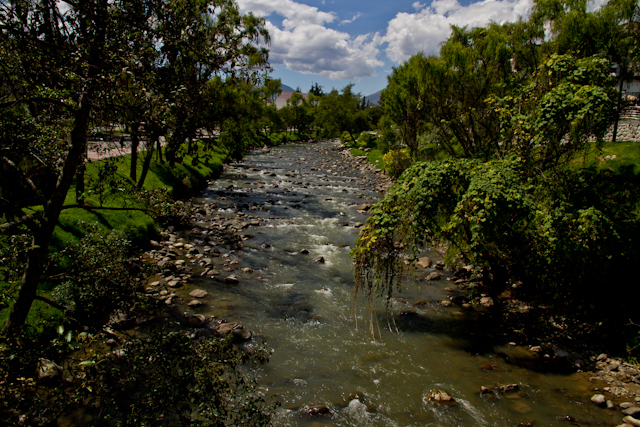 One of four rivers that surround the City of Cuenca - El Rio Tomebamba. Bo and I can walk here in less than 10 minutes and then walk for miles along the wonderful walking/jogging paths. Cuenca is a city of majestic and old churches - Historic church buildings that I never tire looking at. I hope to photograph them in the evening all lit up and sparkling. 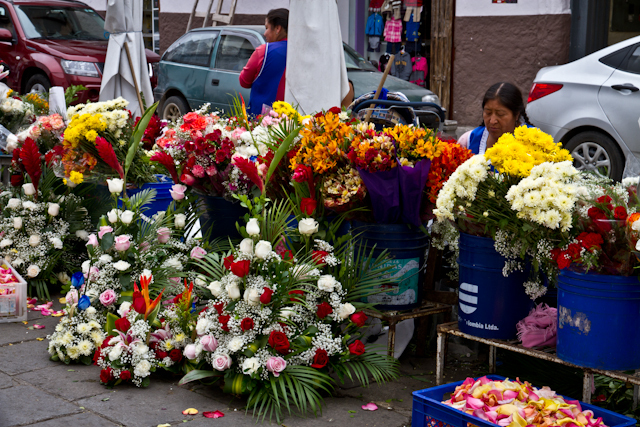 One of my favorite things about living in Cuenca is the amazing flower market one block from where we live. Every weekend Sra. Anna (my beautiful and loving flower vendor (pictured here on the right) makes me a $3 to $5 bouquet of the most beautiful and freshest variety of flowers. She thoughtfully picks them and arranges them especially for me, and I carry my huge (and I mean huge) bouquet home - feeling very special and happy. The beautiful vendors I know personally and the colorful flower market and amazing prices for a bouquet are only a few of the things I love about living in Cuenca. GREAT post...thanks so much for sharing. It sounds like our projected budget is pretty close to what you are spending, although I've allowed a slightly higher rent plus TV/Internet. If we find a place with that included, that's great. Every person's budget will be personal and what works for them - so I'm glad this visual gives you an idea of what you can expect realistically for the frugal-minded's living expenses here in Cuenca. We continue to search and learn more ways to save on groceries etc. Can't wait to read your future posts on your budget and lifestyle here if you decided this is where you will settle. I so look forward to meeting you too. You are right, it's easier to shop in the states weekly for groceries and monthly for staples. I used to do the same thing. Because the produce is so fresh here, it doesn't last as long, and I too love going around the corner to pick up staples here and there. I'm LOVE city life - not fighting the traffic and big stores. Life is simple here. You will have fun learning where and how to shop here for what works for your family. It's all a learning process in a new country. I appreciate your prayers Mara. I'm glad you found this post helpful and informative. Continue to enjoy our blog, and I will be in touch with you via your e-mail. It's a joy to find a blog with quality photos. I'm enjoying your work as much as your writing. Thanks for sharing. I'm glad you are enjoying the photography I share on our blog. This is a wonderful city to capture with my fabulous and trustworthy Canon 7D. Photography is my passion and I pack my camera with me where ever I go. Stay tuned for more posts and photos. Most of what I read so far on living in Ecuador seems to involve rental property. Is there a particular reason why renting is preferred over buying? Appreciate your insights! 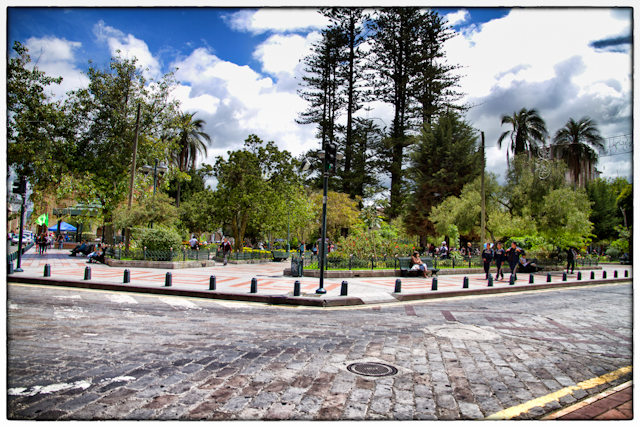 We hope you are finding our personal adventure in Cuenca helpful and enjoyable to read. Without "unity" living in another country and culture, this would be an impossible journey together. I'm thankful for the friendship and wisdom we share together as a married couple on this new adventure together. We're making more memories! Giving is easy here - the people here are precious and touch our hearts daily! The only insight I have about renting vs. buying is why we personally prefer to rent. Because we have only been here a little over 5 months, we are still finding our way. As you may have read, we've moved A LOT since being here - for different reasons. We want to be free to leave, should we choose to do so, and we are still exploring different areas outside of Cuenca. Many ex-pats we've met have bought condos and homes here - some after being here only a few weeks - even days. I believe it's all a personal choice. For us, renting works better for our budget and present lifestyle here! We hope you continue to enjoy our blog, Mike. Welcome to our Blog, Jolanta. I hope you continue to "love it" and that you will realize your dream(s) to come to Ecuador and even stay. It is such an affordable country, and the people are truly precious and loving. After living here, the cost of living in the USA seems extremely expensive, no matter where we went. I imagine Vancouver, BC is the same. It's a big world out there! I know you'll find your place to retire. What about internet costs? You did not include those. Is there high speed internet available there and what would it cost per month? I am planning on another visit to possibly relocate but my job requires I have a good high speed internet as I use a VOIP phone for work. Can you give me some kind of ideas what that would cost per month? At this time, we did not have to pay for internet - but now, in our current apartment which we've furnished, we pay for ETAPA internet, $28 per month. It is high-speed and works GREAT for us in our El Centro location. There are many places to get more information on some of the ex-pat forums if you want specific questions answered. Actually Vancouver is the 2nd most expensive city in the world to live in. I can collect an early pension (one of them come April) and sis is 18 months behind me but already collects a pension with one company so we probably would be okay to retire together. I honestly don`t know whether we should buy (love the look of Manta but not seeing it personally, I cannot say). Perhaps renting is a better option. My email is jolanta.robertson@gmail.com. We do cross border shopping as much cheaper for wine, clothing (and we are finding that the population in Vancouver is now mostly Asian and they too love to get a deal (lol). 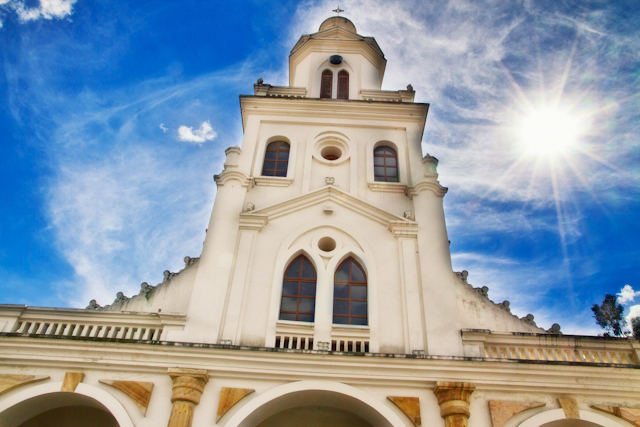 We were born in Europe and Ecuador has some beautiful architecture. Please fee free to email me personally and thank you for replying. I wish you the best as you figure out all your options for your Ecuador adventure. Renting is a good option until you are sure where you want to permanently plant yourself. It makes it easy to Up-and-GO! Some buy because they want an investment property. We've chosen to just rent because we want our freedom to leave, should we decide to move on to another area or country. It works for us. Stay in touch and contact us when you get to Ecuador. I am considering retiring in Cuenca, and I am an artist. Can you tell me if there are artist enclaves, and how much it might cost to rent a studio and buy art supplies (paints, canvas, etc.)? Thank you. Welcome to our Blog, Joann! May you continue to enjoy it, and I hope your retirement plans will bring you to Cuenca. It's such an amazing and artistic place to experience. There are many venues for artists here, and I'm sure studio rentals, gallery space, and art supplies are going to be available and reasonable for any arriving artist. You'll have to find those things out from other artists here, since I am not informed personally about this. One of my dearest friends here is quite a talented artist, so if and when you arrive, I can connect you with her. Keep me posted on your future plans for visiting or retiring to Cuenca. Hello, and thank you for this excellent blog. My name is Jim Brantley. I am a writer and retired newspaper columnist. But enough about me. Ecuador has made my short list of places to live and your input has been very helpful. You have a very good writing style which urges the reader to keep going. Finding a blogger who isn't trying to sell me something is refreshing. I am single so your information on the cost of living eases my apprehension a bit...if you can do it I should be able to. Okay, I may be a man and something of a careless heathen, and probably won't be able to keep things as well ordered as you have, but as long as it gets done with minimum chaos I'm a happy camper. Oh, and congratulations on being married for 23 years. That is almost impossible to achieve these days without one of the partners researching the laws on justifiable homicide...well done; well done, indeed. I'm glad you enjoy my writing style, and I hope you continue to find my posts informative, and that my photography will show you how absolutely beautiful Ecuador is. So, keep on reading, check out other people's budgets, and I'm sure you will make an informed and wise decision if this is the place and lifestyle for you. I enjoyed your writing to, and your comment made me smile. Your blog was incredibly informative. More than once I found myself feeling as though we were sitting at a coffee shop as you divulged the tales of your most recent adventure. Im a 27 year old single Nurse Practitioner. It's looking like I won't be able to work there so I'm considering taking a leave of absence for a few months at the end of the year to come stay for a while. As my plans are to come with a lack of plans I query the best way to find an apartment while here in the states? Did the two of you just pick something and then move once you realized what didn't work for you? I'm so glad you are finding it informative and an enjoyable read. It's been quite the journey, not without many challenges and "letting go" of life in the USA - but the rewards have been continual relationally and economically, with each day being a new adventure. Before our arrival (we did not do an exploratory trip - we just decided to come! ),Bo and I were able to line up a temporary condo via e-mail, after posting our need on GringoTree. Because the owner was coming in a few weeks, we found a longer-term apartment in El Centro, but as you know from the blog, we moved 5 times in less than 4 months. We have been in our 5th place for almost a year now! We are always open to moving if it's an upward move. So far, so good here! I would suggest you stay at a hostel in the heart of the Historic District while you are searching for an apartment. They are always available. There are very nice places where you can stay for a budget of $20 a night that include un desayuno, some higher and some even less expensive - but you get what you pay for! Yes, we moved when we realized what DID NOT work for us - and now we are settled in - until the next place comes along. We already have one lined up in the Historic District, but it won't be renovated or ready for many months. Time will tell. If you send me your e-mail, we can stay in touch. I'd be happy to give you any information I know of that might be helpful for you. How exciting that you have a stay in Cuenca planned. There is so much to see and do here, so be ready for a wonderful journey. It is a very artistic, historic, and beautiful city. Thanks for a real down to earth and uptodate account of living cost. I have looked at several places to retire overseas and have decided on Ecuador. I am looking at a move around the first of the year and would like to find a nice 2 bedroom furnished apartment in a safe area. I plan on living on just my social security of about $1,500.00 a month. Is this possible? Welcome to our Blog John! I'm glad you found our "Cost of Living" post informative. I posted a more recent one after we moved and things changed for us - and we're still in the same range budget! There are many people who move here and are living on just their social security, some with less than yours. Currently the requirement for a pensioner visa is $800. Some just make this qualificatioin on their minimal social security. I know someone personally who is purposing to live here on less than $1,000 a month - and rents a 2 bedroom 2 bath apartment in El Centro for $300 a month. So, yes it is more than possible for you to live here on $1,500 comfortably. Things change continually here, so I'm speaking for TODAY and also because I know Bo and I live on a very frugal budget and we are not lacking for anything and have a very comfortable lifestyle here. Best to you, John, as you make plans to come to Ecuador and start your new adventure. 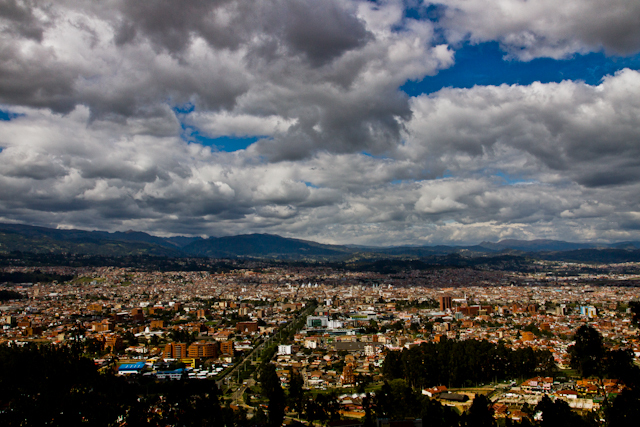 It is a beautiful country and Cuenca is an amazing city. I hope you continue to enjoy my blog posts as you follow our adventure here! Exacty what papaer work is required for a pension visa and do you recomend getting any shots before I come? There are many forums and accurate information on-line to answer most of the questions you will begin to have as you prepare for your move here. I googled your question, and there were several sites that can help you. One is http://www.expatexchange.com/expat/index.cfm?frmid=202&tpcid=3380183. When Bo and I began to prepare for our move, we joined Expat Exchange and others - reading diligently to become informed. I hope you find this one site helpful, but know there are many more. I have several listed on the side bar of my blog. Also, you may want to sign up with "Ecuador Ex-Pats" on Facebook. Though they get a bit snarky and off-track on some of the postings, I check in there and LURK just to be informed. They are happy to chime in (sometimes too happy) and give you their opinions, advice and help. Let me know if there is any other way I can help. Welcome to our Blog! I can only tell you what I know - there are others who have moved here with only a $1,200 monthly pension and are "making it" here. I have a single friend who is living on less than $1,000 a month here. It all has to do with how you are willing to live - housing, eating out, etc. There are also many ex-pats here who only speak English - but are taking classes to learn basic Spanish for communicating with the Ecuadorians. This is key to truly enjoying the culture here. Continue to do your research, come visit, and I'm sure you will find your answers before taking the big leap! I hope you continue to find our BLOG helpful and informative. We are thinking of coming back to Cuenca end of this year or beginning of next year,we had such a pleasant visit and we will spend ALL our time Cuenca so we can experience the day to day life and come back and wind up things here. Your blog is as always so well written and photographed it brings a cheer to my day here. Wow, what a wonderful surprise to hear from you and know you are returning to Cuenca. We look forward to seeing you and spending time together. You will be coming when it is warm and beautiful sunny weather. It sounds like you are planning to relocate here - yes? Thank you for your kind words about my BLOG postings and photography. I continue to enjoy sharing our journey with our readers. Keep on reading, and soon you will be here to continue getting acquainted with this beautiful city. We sure love it here. How exciting for you and your family to be preparing for a new adventure, and with Cuenca as your destination. You both sound like talented and industrious people! Speaking perfect Spanish will make your transition here so much more exciting because you will meet and know many of the lovely Cuencanos and make friends quickly. As for continuing your professions here, that will unfold as you meet and talk to those who can help you in that direction. I, personally, do not have any information for you in that area but know there are others here in those fields working successfully. I believe in the motto, "Do what you love, and the money will follow!" You may not make the same income that you did in NYC, but you will still be doing what you love in a fabulous city. CHALLUABAMBA, ECUADOR - WITH SPECIAL FRIENDS!!! TEACHING ENGLISH IN CUENCA - hungry to learn!